No matter what happens in your home you can count on EA Restoration, LLC to take care of you! Whether a pipe bursts in the wall, mold is found, or smoke fills the kitchen leaving soot in your home, you can count on us to handle your Restoration needs! No matter the time or day EA Restoration will be by your side to ensure you receive the quality of service you deserve! EA Restoration, LLC is Licensed, Bonded, and Insured to handle your project from start to finish no matter the size! There are many different portions of each restoration project, and we take pride in educating, training, and certifying each of our technicians to ensure you are receiving the best service in the industry. 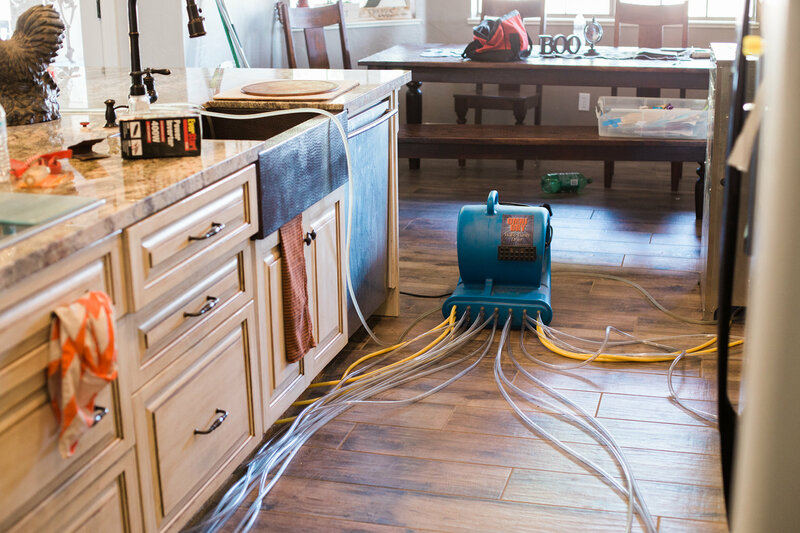 There are many situations that can make a simple project a hazard to your health and the health of our technicians. Mold Spores, Asbestos Fibers, and other Toxins may be present in your home, and can become airborne once disturbed. Before any demolition takes place, it is important that all precautions have been taken to maintain clean air in your home! Our skilled technicians are experienced in building containments, and setting up proper equipment to ensure your home remains a safe and healthy environment for your family. Your health and Safety is our #1 priority! Once your home has been properly mitigated it still needs to be put back together! We are happy to assist you in making your disaster seem like it never happened. Flooring, Drywall, Trim, or Painting? We’ve got you covered! Here at EA Restoration we specialize in several areas. Mold removal, water damage, fire damage, reconstruction and more. Customer satisfaction is our promise! Here’s what our customers have to say about us at EA Restoration, LLC. Craig and brother Cavin did a great job. Started on time and finished early. Plenty of man-power and equipment. I’ll use them again! Craig and Cavin were very professional throughout the whole process. They were very helpful and knowledgeable. I would highly recommend them to anyone else. EA did a minor kitchen and bath remodel for us. The workmanship was excellent, and the price was more than reasonable. EA communicated frequently with us throughout the project keeping us informed of progress and next steps. We would definitely use them again and would recommend their services. I am super happy with the people and the job. Everything was handled professionally and fast. Everyone was careful with my things and was ready to answer any questions. I would highly recommend this company. I contacted EA Restoration regarding a potential mold problem yesterday, and they came out a few hours later to check it out, which I greatly appreciated. Very professional. Thank you again! The project went great, no complaints at all. I had a unique situation to get repaired, although not water damage they were able to completely fix the issue. Very polite and professional. They responded quickly, arrived within a half an hour to give an estimate and were on the job within 3 hours. All done thoroughly and efficiently. EA Restoration treated a moldy wall in my garage. The team was on time and worked late into the night to get the job done. They were polite and kept me well informed of the process. Well done! The guys are honest and want to make sure the job is done right. Cavin and Craig were both professional and quick in their response time and integrity of work was the best. It is hard enough when something bad happens to deal with the issue-great when someone can take a little pressure off your shoulders! Craig and the guys from EA did a great job removing mold from my home. They were very thorough, explained everything as they worked, and answered all of my questions. They worked late to finish the job in one day, and they cleaned up and removed everything as they went. I would definitely recommend them. Professional attitude, reasonable charges and good work. As an insurance agent, I only want my clients to have the best possible experience during a loss so I always refer them to EA Restoration! They’re fast, friendly, reasonable and most of all, they know what they’re doing. #1 mold treatment in Phoenix! I called EA-Restoration after finding mold where are water heater had been leaking. They gave me a fair and honest quote, and were able to start on the removal the next morning. Never having dealt with a home owners insurance claim before, I expected it to be overly painful and frustrating. Despite issues with the first agent low balling the estimate of the removal and repair costs. Calvin was able to get another agent on the claim and managed to get us a fair estimate resulting in $2,600.00 difference. Calvin really went above and beyond to make sure we were taken care of. I highly recommend EA-Restoration, it was a breath of fresh air being treated like a person instead of just another paycheck. After learning I had a wet wall in bath area, EA came out and provided multiple estimates based on scenarios covering best and worst case of what the underlying issue was. They came in with best price AND have me a good comfort level of expertise and ability to take care of issue without doing unnecessary things including mold testing (unnecessary if proper clean up protocol is followed.) Turned out my issue was worst case, and they showed me- no shower pan. Required complete teardown and rebuild. While they originally failed to provide an estimate for one part of the job, they compensated by eating the cost of the teardown. The job went well, they worked hard to ensure all was done to my satisfaction, including running around to multiple tile stores looking hard to match what existed in rest of bathroom. Job was done well, and all involved were professional, timely and trustworthy. I would use them again- and actually am!